Holy moly, I am so excited to show you guys these items. 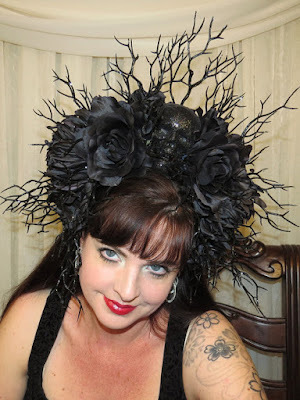 This Etsy seller, Coquettishly Adorned, has some of the most beautiful headpieces. It is incredibly hard to only show you a few! So I really encourage everyone to take a look at what they offer. I guarantee there is something for everyone. Each of these items are one of a kind, so if you want to stand out and have something no one else does, take a look! 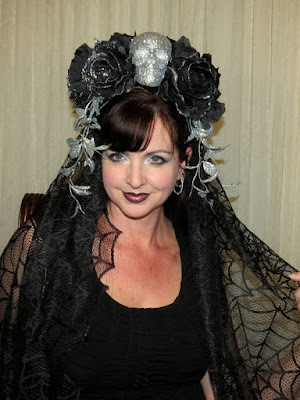 The Silvered Death Headdress is made with silk flowers, a head band, and a very unique web veil. On the top a silver glittered skull is placed among silver edged black roses and trailing vines of silver glitter. It is long and fluttering on the sides and shorter in the back. This is all built on a headband, but apparently still very comfortable to wear and won't wobble around. The Gravewidow is a more subtle, but still dramatic addition to any outfit. There is black fishnet fabric that can be worn as a scarf or worn in the back. I like how versatile it is and how it can be worn practically anywhere. It is made with silk flowers, a headband and a veil. I don't know if I could pull it off, but I love this Tattered Day of the Dead Headdress. 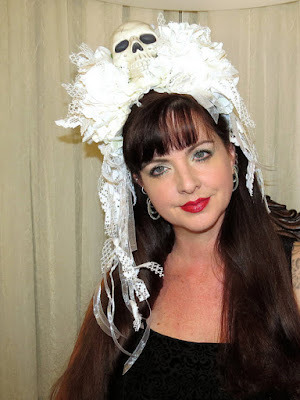 Again this is made with silk flowers, a headband, a skull, and ribbons. A skull is placed among the palest ivory flowers, tattered pieces of white lace tucked through out. It's a very eerie and elegant head dress. 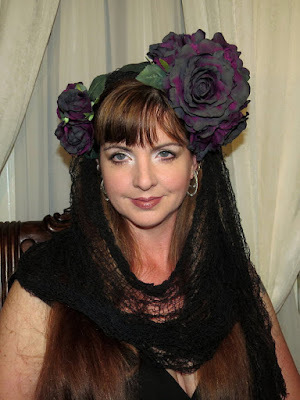 The Rogue Gypsy Gothic Headdress is probably one of my favorites. I love how it drapes over on one side very naturally, especially for those with long hair. 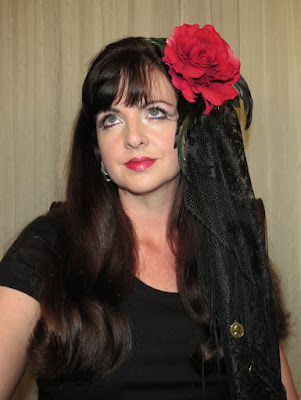 It is attached to an easy to wear black fabric covered headband, with a large red rose, iridescent black feathers, flowers, and leaves. The events you could wear this to are endless. What a crown this is! 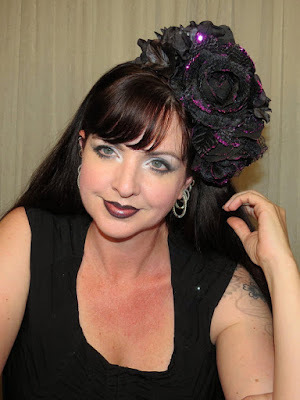 The Persephone Queen of Hell Goddess Crown is so glamorous! I can definitely feel the vibes of dark royalty from this headpiece. It is made with a headband, silk flowers, a skull covered in glitter. There are black roses, black spider mums and beautiful styling make this piece a head turner! This is a little different, but I still like the design! 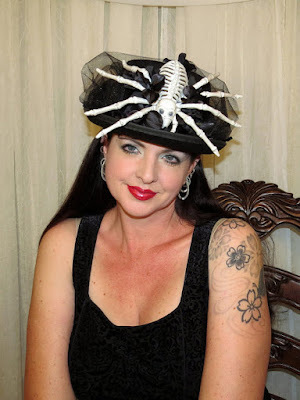 The Spider Bones Headdress is built off of an old English riding hat. It is made with silk flowers, a spider skeleton, and an adorable woman's bowler hat. Attached is a lightly sparkly glittered black net. It's lightweight and cute! The Blackened Purple is a simple design, but is absolutely sophisticated. It is made with silk flowers, a headband, and lots of lace. It has a touch of purple glitter, so that it isn't distracting, but adds an element of color. I love the simplicity of this particular headdress. 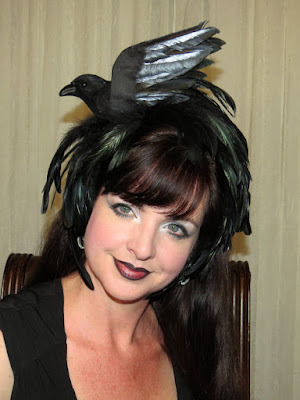 Finally, this Raven Dance Ballet Style Headdress is stunning. It is built on a black fabric headband for easy to wear stability. The feathers are black and iridescent and a raven is nesting on the top. I think anyone could pull off wearing this at any occasion. It is like looking at a piece of art. I hope there was enough variety to show that Coquettishly Adorned has so many things to choose from. I didn't even scratch the surface! Tell me some of your favorites in the comments below!